Speedsport had a great start to the 2019 HFF season with Ben Tusting finishing second and Pierre Livingston finishing third at Donington on March 30th. An eventful race saw Ben climb to second place, behind last season's champion Cameron Jackson, whilst Pierre scrapped his way to third position after a fraught multi car battle for the whole race. 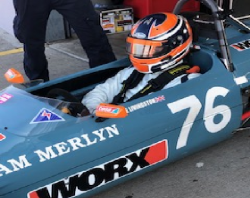 Next round of the Championship is at Silverstone on May 18/19 where Ben and Pierre will be joined by Ed Thurston - Ed won the Historic Race at the Walter Hayes Trophy in November 2018, so we are hoping for another successful day !